“They deserve the best. I came all this way, me and my cooking knife.” A twenty-four year-old copywriter decides to take the plunge as a chef. 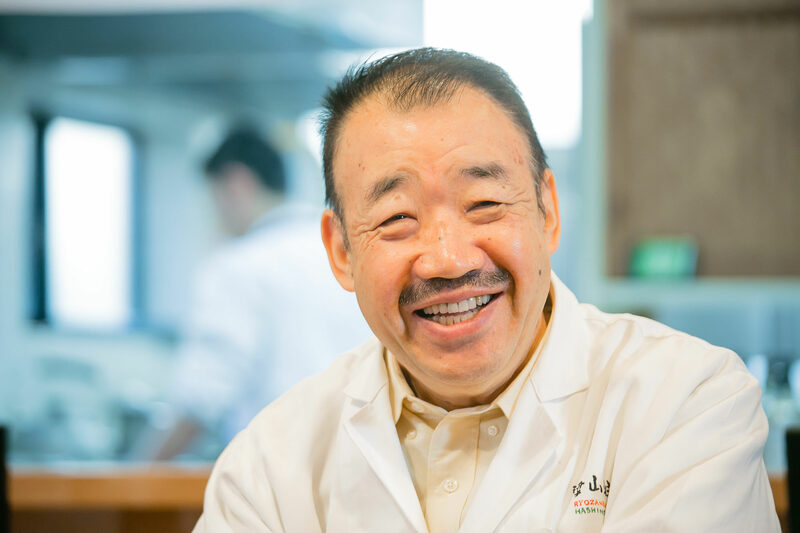 Today, some forty years later, he is the proprietor of a famous Kyoto establishment. Ryozanpaku has garnered two Michelin stars for seven years in a row since 2009, with noted cultural luminaries like Osamu Tezuka (a cartoonist) and Soh Kuramoto (a scriptwriter) dining there. 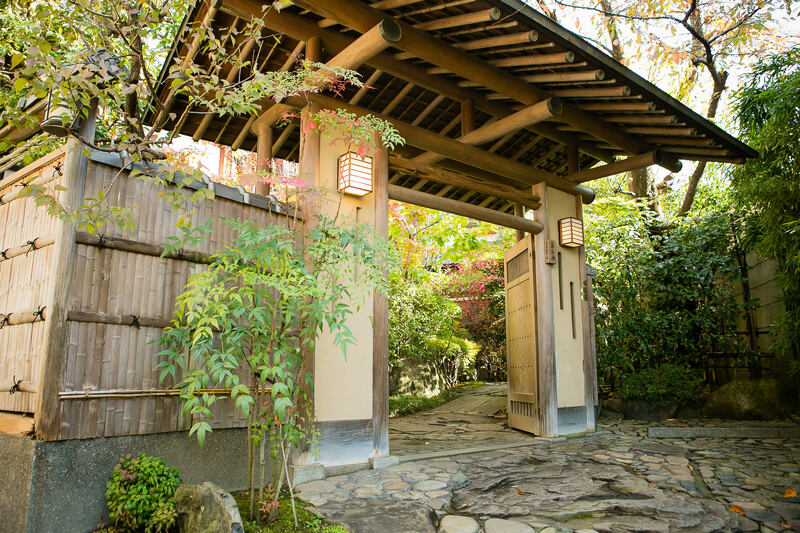 The shop is located in a traditional house in the Hyakumanben area near Kyoto University. 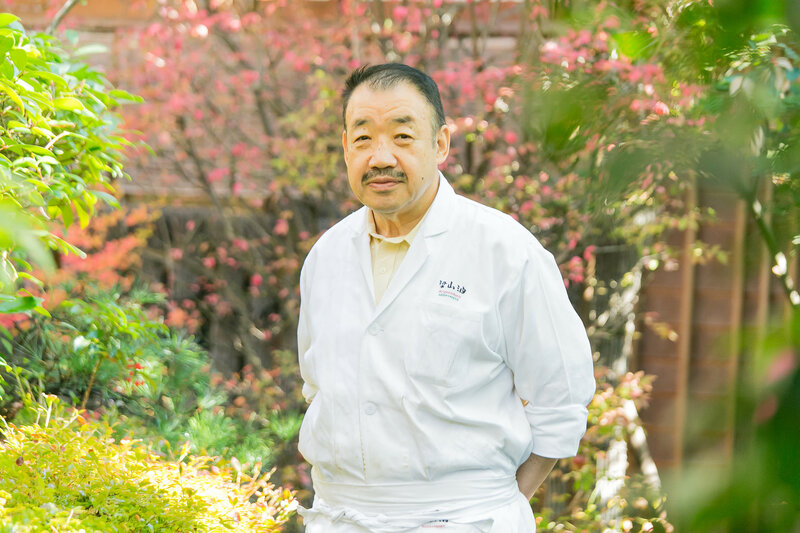 With a garden showcasing the four seasons and even the furnishings carefully accounted for, Ryozanpaku is the stage where proprietor Ken’ichi Hashimoto draws from the finest fish, sake, vegetables, and other ingredients, preparing them in water from a natural spring on-site. 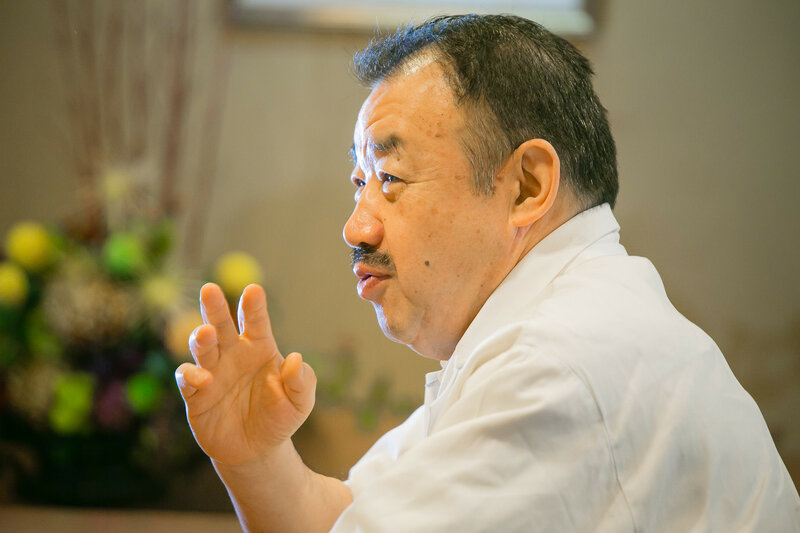 Hashimoto is also the author of nearly ten books. In 2014, he obtained an MBA from Kyoto University’s graduate school. In this way, he continues to take steps beyond the normal confines of a chef. We sat down with him and gleaned his insights on his personal philosophy of life and how he approaches running a shop and training personnel. This is a very charming space. What was your inspiration for taking up cuisine? I was born in this home. 22 years ago, we had an inkling that there would be more foreign guests, so we decided to convert it into a pure Japanese home made of soil, wood, and paper. My wife, an amateur in architecture, studied for ten years to design the plan. I handled the wiring, created a workflow, and solicited contractors to place bids for the work. This was actually what triggered the process of my becoming a chef. I had studied food engineering at Kagoshima University, but I was actually obsessed with underground theater and was an actor. Meanwhile, I helped Noriaki Tsuchimoto screen his film about the victims of Minamata Disease. I managed to mobilize a huge troupe of actors, and I was discovered by a “black tent”*1 that was in Kagoshima at the time. I wasn’t really up for it, but I told them I’d take the job if they let me by a copywriter. They told me a fib about having connections in publishing, and I fell for it. (laughs) That took me to Tokyo. However, my mother fell ill. I’m sure it took a toll on her to worry about me being enrolled in university and going to and fro between Tokyo. I felt responsible for her, so I decided to come home. It fell to me to figure out how to start a new career. I knew I had to be responsible, but I also wanted to do something fun. I had the idea that business and sales would be fun. But what kind of business? I had always liked to eat, and my mother had taken me to restaurants in Gion as a child, so I had this image of chefs as cool. I thus decided to open a restaurant here. I thought that this would bring the tastiest food to me, all in one place. I never thought I’d be doing it for this long, though. I was a total amateur to cooking, after all. Over a brief span of time, you made a heavy transit between Kyoto and Kagoshima, and then to Tokyo, then back to Kyoto. That’s quite right. There was campus strife, which influenced me, so I named the shop Ryozanpaku, inspired by the name of the citadel in the Chinese tale of Suikoden, where warriors oust evil and save the kingdom. I wanted this place to defy common thinking and let me be true to myself. The name almost comes across as quite showy today. It was a rebellious time for me. Based on my experience with set design, I designed the foyer and guest area myself. I persuaded a longtime gardener acquaintance of mine to do the garden. I told him, “Didn’t my parents do you right back in the day?” (laughs) In one month’s time, I had opened the shop. It was 1973, and I was twenty-four. You went from deciding to become a chef to opening your shop in one month? Did you train anywhere? No, of course not. I’ve never been formally trained. I was rotten at it, but my older sister is a good cook. My only forte was making broth, so I decided to start with oden soup and take it from there. That’s right — this started as an oden shop. After about three months, a fish shop in the neighborhood goaded me: “You don’t even know how to prepare fish, man?” So I decided to have a crack at fish. They taught me the basics, and I started buying from them. Oden was off the menu at that point. However, when I ordered the fish they recommended, I made no profit. It turned out they were selling it at above market rates. I felt tricked, so I decided to procure from a fish shop in Nishiki Market in Kyoto. They even showed me how to prepare blowfish, and I got my license as a blowfish preparer. After ten years, I met a certain Mr. Maruyama, a former fisherman who ran a fish shop. He took me on his ship to find delicious fish you couldn’t even catch sight of at the market. That’s how I learned the ropes. The same went for vegetables and sake. It’s surprising to hear that you eschewed formal training at restaurants and operated your shop while learning from fish merchants. Was it at this time that you started building relationships with producers and wholesalers? Yes, I thought that would be the quickest way to get where I wanted to go. Perhaps its because I was in theater, but I had the impression that culinary schools and shops emphasize common-sense thinking, but this gets in the way of creativity. I wanted, as ever, to do things my way. Furthermore, I had studied food engineering at university, so I already had an understanding of how proteins change, how amino acids shift, and how foods are manufactured. I was confident that I had a level of scientific knowledge that could stand up to that instructors at culinary schools had.